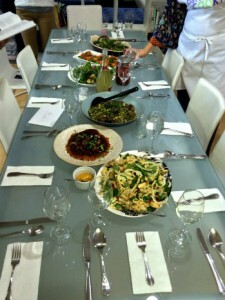 We recently hosted our November Cookbook Club – a special lunch we can’t help but look forward to. As usual, it was a hit! 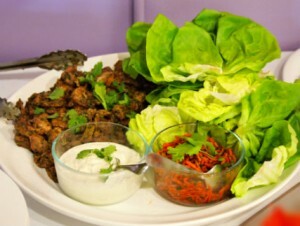 This month’s featured cookbook was Jerusalem by Yotam Ottolenghi and Sami Tamimi. If that first author sounds familiar, that’s because we featured his cookbook, Plenty, in a previous cookbook club. Our reviews were so positive we had to give Jerusalem a try. From flavorful vegetable dishes to sweet deserts, this book boasts 120 recipes accompanied by gorgeous photos. Both Jerusalem-born authors share recipes from their home city — influenced by diverse Muslim, Jewish, and Christian communities. Let’s see how recipes were brought to life in a most delicious manner! 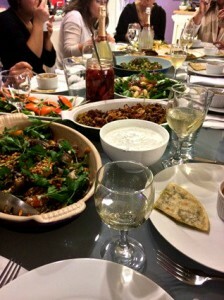 The feast began with Kelle’s Burnt Aubergine & Mograbieh Soup, or in layman’s terms, “Burnt Eggplant Soup”. After the first taste: WOW. I really wan’t expecting the flavors to fit the title so well. The soup had such a unique flavor. Baked aubergine pieces were tossed in with a blend of burnt aubergine and tomato soup. The Mograbieh Israeli couscous added a soft yet firm texture to each spoonful. It was distinctively delicious! 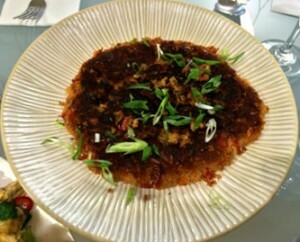 Tanya presented a fantastic looking and tasting dish: Couscous with Tomato and Onion. 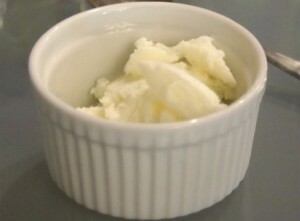 It was so light, airy and buttery, everyone helped themselves to seconds and thirds (guilty)! The toasted top layer of couscous provided a crisp bite, and was followed by the tasty tang of tomato. Sprinkled with green onion, this simple dish would make the perfect side for any meal! Erica made a vegetarian-friendly Middle Eastern rice dish with lentils and freshly fried onions, Mejadra. I unapologetically bathed my food in the absolutely delicious cucumber yogurt (Greek, of course). For extra credit, Erica also brought a jar of curried pickles. Veggies like cauliflower and rainbow carrots floated in cider vinegar and curry powder. The purple carrot even turned the liquid an awesome shade of purple. 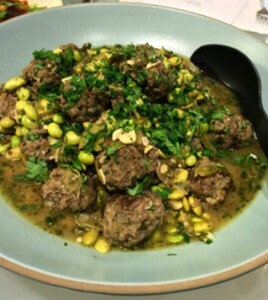 Crissy made mouthwatering Meatballs with Fava Beans and Lemon. After soaking in a stock with spices galore, the beef and lamb meatballs were so flavorful! The light green edamame and dark green cilantro garnish added vibrant color, making her plated dish looked like something out of a magazine. I highly recommend pairing this dish with rice! 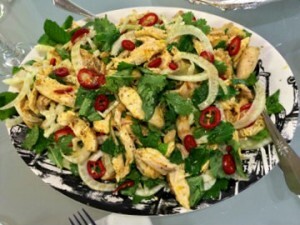 Beth made a striking Saffron Chicken & Herb Salad. Citrus, honey, black pepper and mint gave the arugula and basil leaves a sweet zing. Grilled chicken pieces seasoned with olive oil, garlic and orange puree were also tossed with the greens and aromatic saffron, making the whole dish come together like a sweet symphony. Mary brought in an amazing Herb Pie. The creamy blend of ricotta, feta and aged cheddar cheeses were balanced by the perfect amount of Swiss chard, arugula and parsley. Hints of dill and onion weren’t lost in the shuffle of the other ingredients, and the pie was baked with an incredibly light and flaky buttered filo pastry on top. So satisfying. 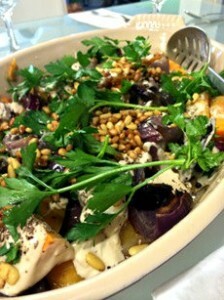 Bibby brought in a gorgeous dish of Roasted Butternut Squash and Red Onion with Tahini and Za’atar. The rich colors sure caught our attention, but the Za’atar herb really gave the dish its Middle Eastern flare. The first bite was a blend of creaminess from the tahini and the soft, meaty squash — YUM. For extra credit, Bibby brought along some skewered persimmons from her backyard! Christina made a Spinach Salad with Dates and Almonds. I absolutely loved this dish. 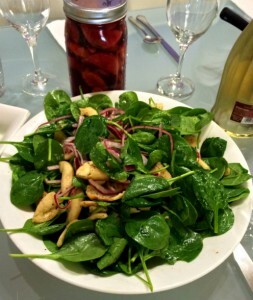 The simple dressing of olive oil, white wine vinegar and lemon was a great addition to the spinach leaves. Tossed with plenty of red onion, dates and almonds, my favorite component was the buttery pita pieces. Yum! For desert, Emily made a fantastic batch of Spice Cookies. The brandy-soaked currant flavor definitely stood out, but the cinnamon-y (that’s a word, right?) and citrus flavors held their own. 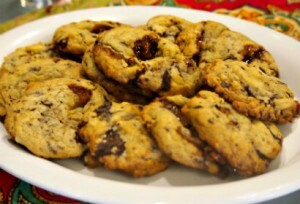 The lemony sugar glaze paired surprisingly well with the chocolate in the cookie. The typical overachiever, Bibby also prepared a Semolina, Coconut and Marmalade Cake. The semolina and sweet marmalade made for a crumbly and delicious treat! There is never a boring day in the PTC office. We once spent an entire week debating which cookbook to feature in our next cookbook club. Emails zinged back and forth before Christina had a brilliant idea. Everyone was asked to bring in their favorite summer dish. (The perfect theme for this girl!) Earlier that week, I visited B Patisserie in the Pacific Heights neighborhood. I was thrilled to discover a variation of Flammkuchen, a delicious German “pizza”, on their menu. B’s substituted toasted ciabatta for pizza dough, and I was enamored with the extra chewy texture. I knew what I was going to make for cookbook club! Coming into the office on the day-of, the refrigerator was packed with various containers of this and that. I barely found room for my own shopping bag of ingredients. At about 11:30am, we trickled into the kitchen and started the prep-work for our dishes. We were soon peeking over each other’s shoulders and discussing the best way to plate. As completed dishes began appearing on the table, I pulled out my camera and started playing food paparazzi. First up: Heather made an INCREDIBLE Kale Chopped Salad with a pleasant Spicy Peanut Dressing. I was a big fan of this tangy take on kale. 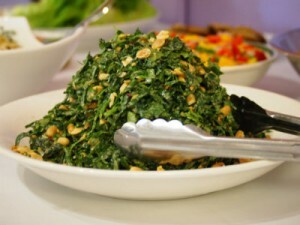 Kale has a pretty distinct flavor, so the peanut dressing really added an unexpected depth. Needless to say, this was well received by all in the office. 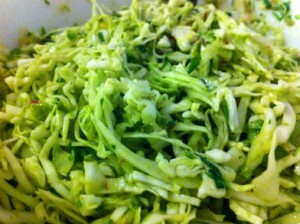 Also on a summer salad bend, Erica, our warehouse manager, made a delicious Cabbage Salad with Avocado and Jalapeno. I simply could NOT get enough of this. In fact, I copied the recipe and stopped by the grocery store on my way home so I could keep some in my fridge! 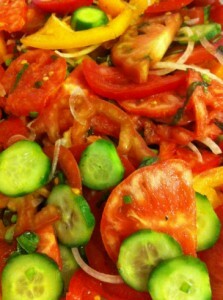 Mary surprised us with a gorgeous old fashioned Heirloom Tomato Salad from Frank Stitt’s Southern Table. I loved these tomatoes. With much more complex flavors than tomatoes you find in the grocery store, I was immediately transplanted to my favorite farmer’s market. 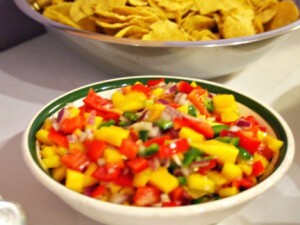 Emily reminded me how refreshing a great Mango Salsa can be. Tangy and spicy, like a salsa should be, but with a sweetness that added even more depth to the flavor. I loved her mango-to-jalapeno ratio. 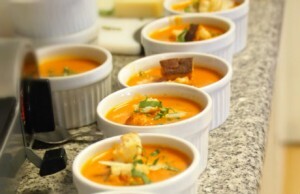 Crissy’s delicious Tomato Basil Soup was the perfect thing to brighten the cloudy day’s mood. Warm, comforting flavors beautifully combined with a slight citrus kick: YUM. I know what I’ll be making this winter! 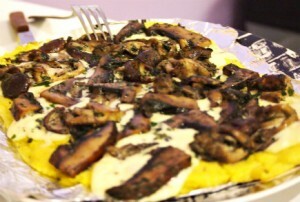 Rebecca made a deliciously rich Mushroom and Herb Polenta from Yotam Ottolenghi’s Plenty. Though this cheesy dish was not making it’s first appearance at our table, nobody cared. I mean, it’s addictively good. Seriously, just go make it. Only then will you understand the heaven our taste buds were in. Kelle must have read my mind (or my stomach?) 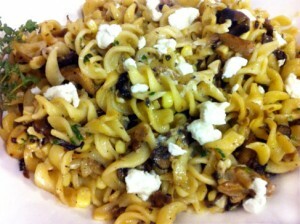 when she brought a delicious Mushroom and Herb Pasta Salad with Corn and Feta. It was the perfect summer dish! Actually, I could see myself making a warm version in the winter. Anything to be able to enjoy this simple dish year-round. Rosie made a guest appearance (cameo by her bright-eyed son, AJ) and really took our breath away with her Chocolate Chip Cookies with Home Made Toffee. Almost dangerous, they were just too good. The sticky toffee left everyone craving more. Christina has been cracking me up for the past month by literally singing praises of stone fruit… but I shouldn’t be laughing. I fully agree that stone fruit is seriously awesome, and we should sing songs about it. 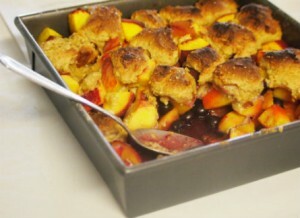 Anyway, with the help of Paulina, our Polish Warehouse Intern, Christina created a deliciously simple Stone Fruit Cobbler. She even left out most of the sugar to let the fruit flavors stand out. Absolutely perfect. Finally, Beth surprised us with Sweet Corn Ice Cream. I’ve sampled some unusual ice cream flavors in my day, but nothing quite like this! The striking corn flavor made for a slightly sweet yet oddly savory dessert. My taste buds were a bit confused, but some folks in the office were clearly impressed.